What is a Mindful Tri? How do I make an Impact? Join us this June for a mindful way to walk in support of cancer care! In our community, we will Tri together. That is why Aurora Cancer Care is excited to introduce the Mindful Tri events not only to help our patients, but also to assist participants in building a cancer –preventative lifestyle. Whether it’s your family, a friend – maybe it’s you – cancer is something that touches us all. We’re all part of the fight against it. In fact, you’re so valuable, it’s you who makes the difference! Hope.Heal.Feel: A Mindful Tri Against Cancer. Cancer Survivors Day honors those living with a cancer history. 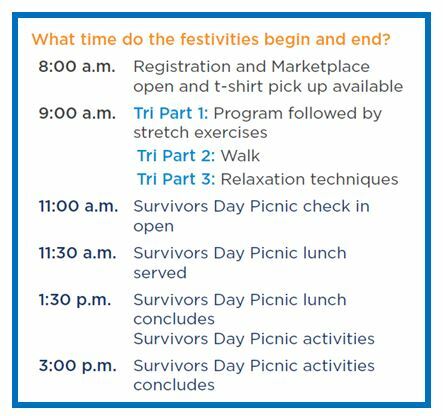 Join us for a family friendly event, honor those in your life, and share your journey with other survivors and caregivers. This year, you have the power! We want you to pick where your impact will be! When you register, choose between supporting local cancer clinics, cancer research, or integrative medicine therapies – all of which will benefit cancer patients in Wisconsin. Have you previously donated to or fundraised for Aurora Health Care Foundation? Log in below with your username and password.